BRIDGEPORT, Conn. -- A tractor-trailer driver who is suspected of pushing a man out of the cab of his truck and running over him during a dispute over drug money will be extradited back to Bridgeport to face charges, according to the Bridgeport police. Lorenzo Anthony Doke, 33, of Big Rapids, Mich., was apprehended in Maryland by the U.S. Marshals Service, where he will be held pending extradition, police said. Once he has been returned to Connecticut, Doke will be charged with first-degree manslaughter and evading responsibility in the operation of a motor vehicle. His bond has been set at $400,000. The death of 56-year-old Ricardo Rose of Prospect Avenue in Bridgeport was ruled a homicide, described as the result of a drug deal gone wrong, police said. The incident began when the driver of a red truck pulling a white trailer, identified as Doke, was cruising the industrial area along Wordin Street in Bridgeport and looking to buy crack cocaine on Saturday, police said. He found Rose, 56, who agreed to sell him crack from a third party, police said. After the driver began to smoke the crack, he said had no money and an argument ensued, police said. The driver pushed Rose out of the truck, and the victim fell under the truck's wheels, police said. 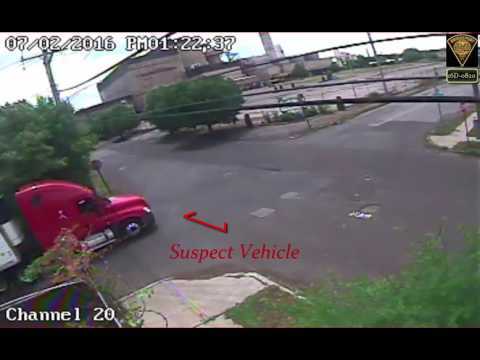 Bridgeport police obtained and released video (above) from security cameras in the area showing the red truck pulling a white trailer moving through the area, then pausing for over a minute at a stop sign. The truck then left the scene north on Hancock Avenue.